The Mission relies heavily on volunteers for its operation. They find it a very fulfilling activity. 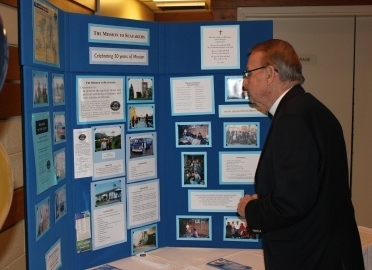 Volunteers are needed for watch keeping, driving various tasks at the Seafarers' Centre; go to Volunteer Opportunity. The Mission to Seafarers: Port of Thunder Bay has a Charitable Registration Number and an income tax receipt will be issued to donors. Undesignated donations are applied to the General Fund; see below General Fund and Capital Fund. Suite 450, 100 Main St. Donations may also be made through the Electronic Offering Program. Individuals who make a financial donation or volunteer and organizations which make a financial donation become a ‘Friend of the Mission to Seafarers', can vote at the General Meeting and receive a newsletter published once a year. Magazines and clothing may be put in the drop-off box at the Seafarers' Centre. The Centre is just inside the gate at Keefer Intermodal, which is open Monday to Saturday 8:00 a.m. to 6:00 p.m..
Magazines: particularly recent ones, especially newsmagazines. Most welcome are those in other languages such as Spanish, Hindi, Croatian, Polish, Ukrainian, Russian, and Tagalong. Clothing: Clean, used or new, but usable, warm, small to large men's clothing is needed. Seafarers coming in April to May and October to December are often not dressed for winter conditions. Suggested donations are: sweaters, jackets, T-shirts, mitts and toques. Pop Cans: The Mission is now accepting pop cans to raise funds. A barrel for the cans is located outside the Seafarers' Centre. For large donations of pop cans, people can take them into Dutchak Recycle Inc, 346-4785, off Hammond Ave (TB Harbour Improvements) and put the cans on the Mission to Seafarers’ account. Staff - The Chaplain, Canon Ed Swayze, is hired on the basis of 45% of a full-time position, roughly 2¼ days a week and honorariums for when Canon Ed is out of town and the services of a priest are required. Seafarers Centre - insurance, equipment, satellite TV, telephones, Internet, supplies, and maintenance. Van - Fuel, license, insurance, maintenance & repairs, washing and depreciation. Aid to Seafarers - Purchase of bibles that seafarers may take free of charge, and Chaplain's discretion fund for emergency assistance to seafarers, and Christmas Gift bags. 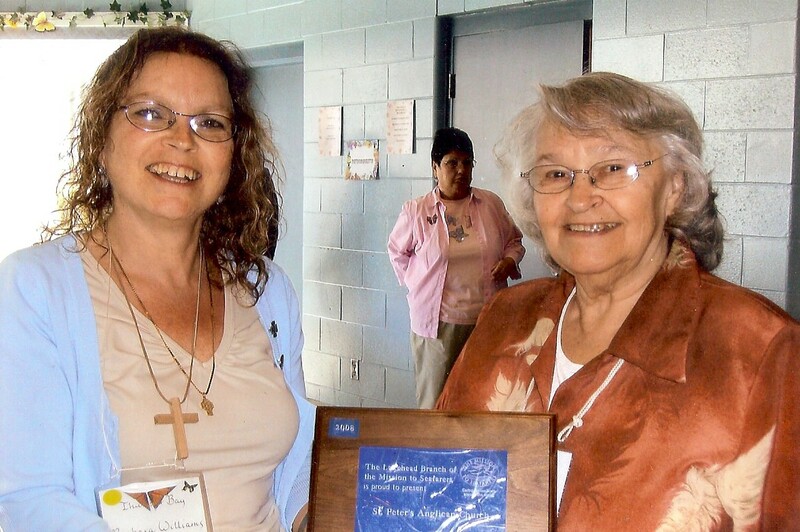 Community Building - monthly Eucharist and lunch, volunteer and donor recognition, advertising and promotion, newsletter, Blessing of the Fleet, MtS Canada membership fee, and NAMMA fee. General Administration - office supplies, bank charges, office supplies, printing and professional fees. 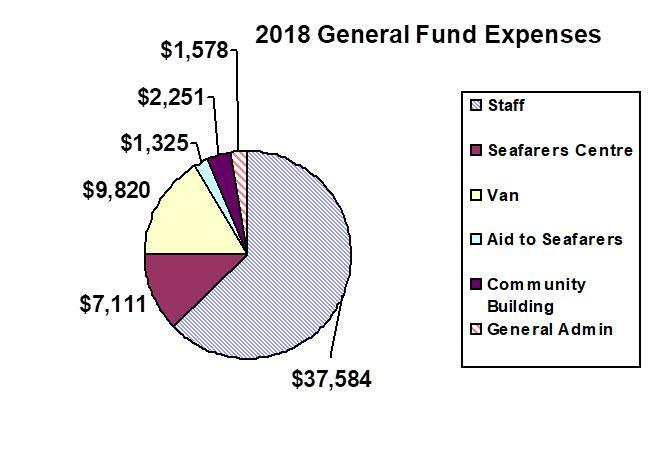 As of December 31, 2018 the Capital Fund has $2,057. Funds to replace the furnace will be held in reserve. * In 2019 the Board is intending to do these projects as soon as funds are available. * To receive port tour, the tour must be booked at least two weeks ahead of time. Van can accommodate a maximum of 11 persons including the driver. Corporate includes any group, organization, business and church. At least one month's notice is required for print materials to be mailed. These presentations take 20 to 30 minutes to present. Arrangements can be made for the chaplain or a volunteer to give these presentations or they can be e-mailed to interested people. Please let us know if you would like to have our display set up for your tea or coffee hour.